Today you will enter code in the Nifty-IAP project’s ProductViewController.swift file to implement tasks shown on this card. Before proceeding I assume you’ve read part 1, part 2, part 3, part 4, and part 5 of the tutorial. I also assume you created a branch called part6 from the branch called part5. Here is a diagram and description of task 1. To implement task 1 in the Nifty application’s ProductViewController.swift file, you’ll have to enter this code in the restoreButtonTapped() function. The statement you entered in the restoreButtonTapped() function ask the SKPayment queue to restore previously completed purchase transactions. The payment queue respond by delivering a new transaction for each previously completed transaction that can be restored. Each transaction includes a copy of the original purchase transaction. After the completed transactions are delivered, the payment queue calls the observer’s function, paymentQueueRestoreCompletedTransactionsFinished(). If an error occurred while restoring transactions, the observer will be notified through its paymentQueue function; which is called restoreCompletedTransactionsFailedWithError(). With that said, here is the code to implement the paymentQueueRestoredCompletedTransactionsFinished() function in the ProductViewController class. Put the function at the end of the class. Go ahead and run the app on you iPhone device and tap the Restore button. 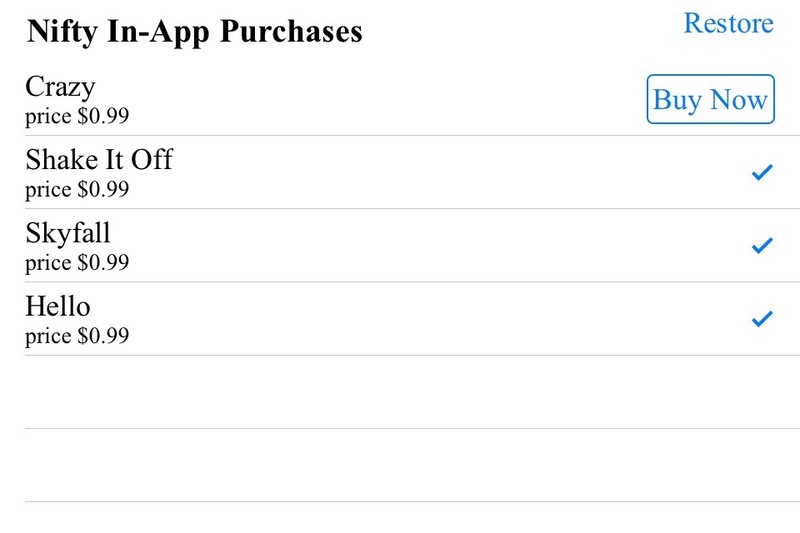 As you can see in the image below of the Nifty app store, it shows which purchased products were restored. As before, you can play a video by tapping the tableView cell that contain a checkmark. When you are done testing the Nifty-IAP app, terminate it in Xcode and use Xcode’s Source Control/Commit command to commit changes made to the ProductViewController class, in the Git repository. 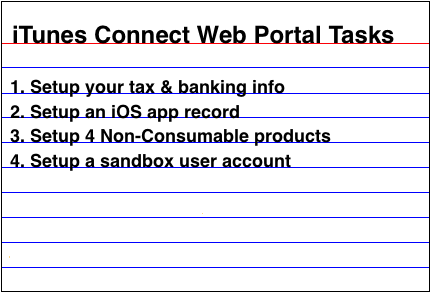 If you provide Consumable product types in your iOS application. The user cannot restored them from Apples’s App Store. 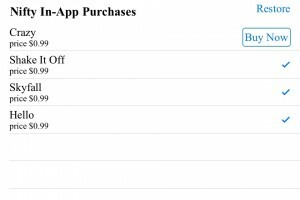 This makes logical sense because consumable products are consumed or used up within your iOS app. In the remainder of today’s tutorial you’ll use the iOS keychain and a third party Swift keychain class to keep track of products the user purchased in the Nifty app and automatically restore them. 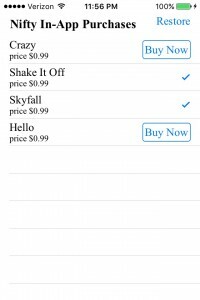 In the real world, you should use the technique you’ll learn today only if you provide Non-Renewable subscription products in your iOS application. 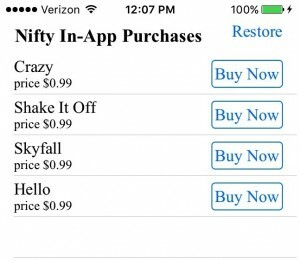 Specifically, you will implement these iOS keychain tasks in the Nifty-IAP app. 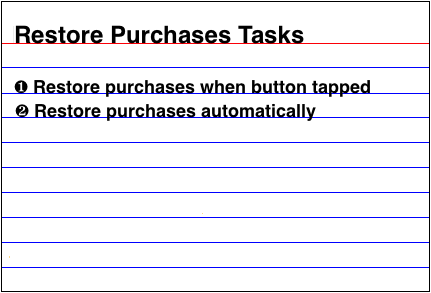 The first three tasks shown in the table below will be done in individual user defined functions. iOS keychain is an encrypted container for storing small pieces of data that needs to be secured. 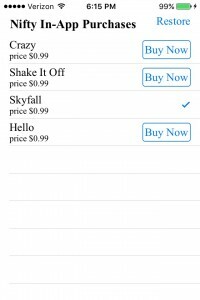 On an iOS device, each application has its own keychain to which only the application has access to it. Data stored in the iOS keychain are safe and unaccessible by other applications. Furthermore, keychain data are stored separately from the application’s bundle. You can think of the iOS keychain as a physical keychain; further more, you can think of the piece of data stored in the iOS keychain as a key. 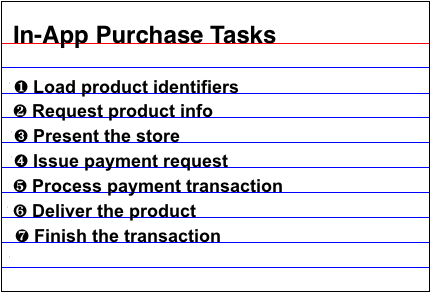 In the ProductViewController class enter the highlighted statement shown below. It declare a keychain object. @IBOutlet weak var headerLabel: UILabel! Enter code shown below at the end of the ProductViewController class. Above code implemented three user defined functions in the ProductViewController class. A description of each user-defined function follows. This function add the product id passed to it, in the app’s iOS keychain. If the product identifier already exists in the iOS keychain, the keychain object’s set() function overwrite the value of the appropriate dictionary’s key. As you can see, an if statement determines which dictionary’s value will be saved or overwritten in the iOS keychain. This function get a product id from the iOS keychain and insert it in the purchasedProductIdentifier set. As you can see the function takes a single parameter; which is a purchased product identifier. We use it in the keychain object’s get() function to get an item from the iOS keychain. Since the item the get() function returns is an optional String, we unwrap it and store it in a constant called pid. Within the if statement block we insert the pid constant in the purchasedProductIdentifiers set. Now, if an invalid product identifier is passed to the getKeyFromKeychain() function, nothing is inserted in the purchasedProductIdentifiers set. This function permanently delete the product id passed to it, from the iOS keychain. 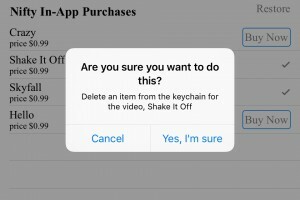 Before the function do that; it display an alert view; which ask the user if she really want to delete the provided product identifier from the iOS keychain. 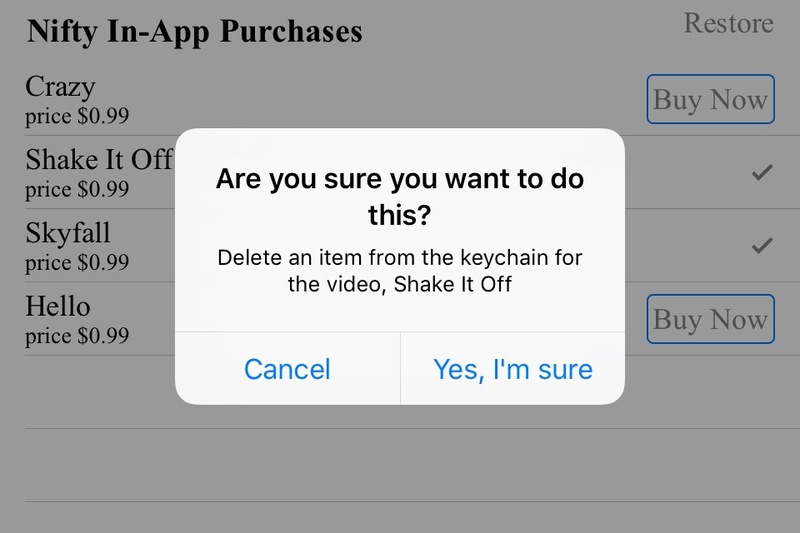 If the user tap the alert view’s Yes, I’m Sure button; the discardKeyFromKeychain() function go ahead and permanently discard the provided key from the app’s iOS keychain via the keychain object’s delete() function. The Cancel button simply dismiss the alert button. It is time to test the user defined functions you implemented in the ProductViewController class. Start by entering highlighted statements in the viewDidLoad function. Now, run the app on your iOS iPhone device and you will see the Apple Sign In to iTunes Store alert view on your device’s screen. In addition to seeing above alert view on your device’s screen; in Xcode’s console, you will see these messages. The second and third one is produced by the print statements you entered in the viewDidLoad function. <tt>Product request was sent to the App Store. 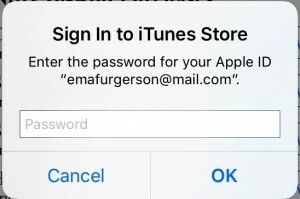 Use your sandbox password to sign in to iTunes Store or tap the Cancel button. To test code you entered in the getKeyFromKeychain() function, terminate the app in Xcode and enter these statements below existing code that’s in the viewDidLoad function. In addition to output shown on your iPhone device’s screen, you will see messages shown below, in Xcode’s console. The fourth and fifth message was produced by the print statement you entered in the getKeyFromKeychain() function. There are 4 elements in the productsArray. To test code in the discardKeyFromKeychain() function, terminate the app in Xcode, and modify the viewDidLoad function by entering highlighted statements shown below. As you can see, the last statement call the discardKeyFromKeychain() function which discard an item from the app’s iOS keychain and the purchasedProductIdentifier set. Run the app on your iPhone device and dismiss Sign In to iTunes Store alert view. You will see this alert view. Above alert view was produced by code you entered in the discardKeyFromKeychain() function. Notice behind the alert view that a checkmark is shown in the second and third cell’s accessoryView. That’s because you didn’t comment out the getKeyFromKeyChain() function that was called twice in the viewDidLoad function. Now, tap above alert view’s Yes, I’m sure button. The alert view is dismissed, the tableView cells are refreshed, and the Nifty app store look like Figure 6-4 now. As you can see, the Buy Now button appear again in the second cell’s accessoryView. That’s because code you entered in the discardKeyFromKeychain() function removed an item from the iOS keychain and the purchasedProductIdentifiers set, for that cell’s product. Alrighty then; terminate the app in Xcode and comment out the last statement in the viewDidLoad() function. Now, run the app on your iPhone device one last time. The alert view shown in Figure 6-3 above, won’t appear on your iPhone device; however, the Nifty app store still look like the one shown in Figure 6-4 above. 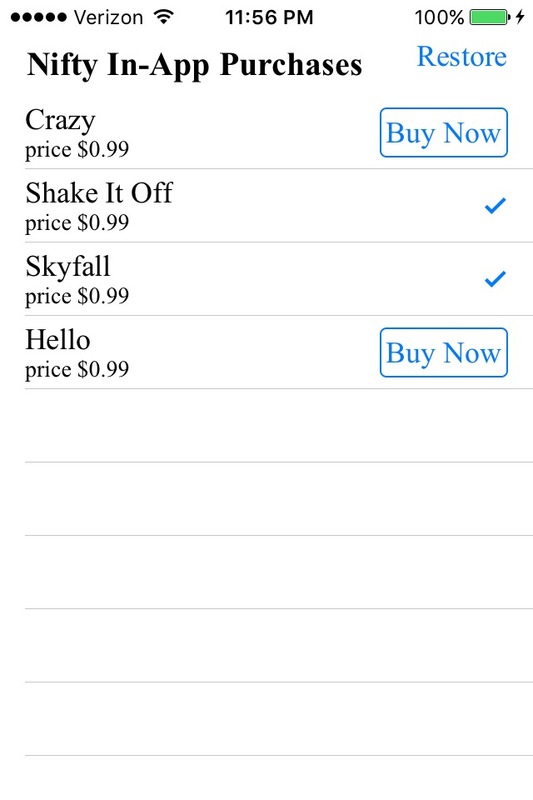 That’s it you are done testing the iOS keychain code in the ProductViewController class’ viewDidLoad() function. Before proceeding I want you to terminate the app. Terminate the app in Xcode and locate the updatedTransactions() function. Next, enter the highlighted statement in it. Now, run the application on your iPhone device and purchase the first product. As expected, the app update the first tableView’s accessoryView by replacing the Buy Now button with a checkmark. Go ahead and watch the Crazy video. 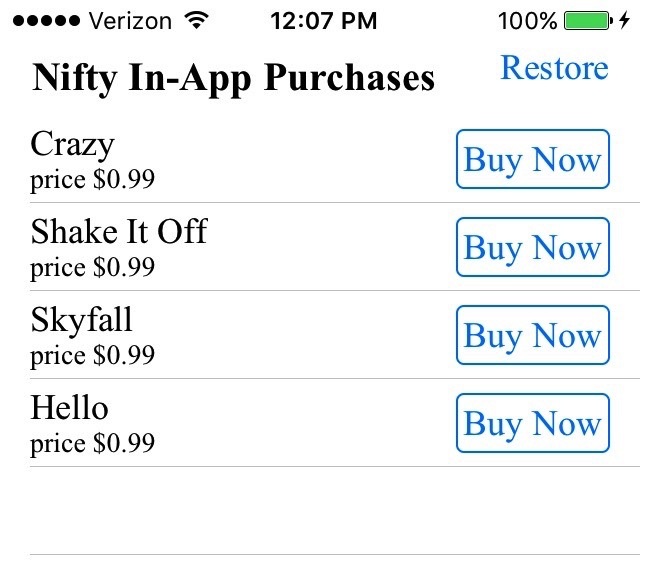 When you are done, return to the Nifty app store and terminate the app in Xcode. The next time you run the app on your iPhone device, you will see a checkmark only in the first cell’s accessoryView. Use Xcode’s Source Control/Commit to save changes you made to the project in the Git repository.